Robert EDWARDS (1612 – bef. 1641) was Alex’s 10th great grandfather, one of 2,048 in this generation of the Miner line. Robert Edwards was born in 1613 in England. He married Frances FAIRFIELD. Robert Edwards, aged about 22, who came on tho “Hopewell” from London in 1635. Robert died before 1641 when his wife remarried. Frances Fairfield was born in England, Her parents were Daniel FAIRFIELD and Mary SHAW. She was most likely John Fairfield’s sister, as her child Matthew Edwards (from her first marriage) later refers to John as “Uncle.” An additional sibling relationship to Frances (and thus to John, as well) is inferred by the reference in her will to “Elin Hilles, her sister in owlde England.” After Robert died, she married Robert Hawes. Frances died in 1645 in Salem, Mass and her will was probated 10th 7th mo., 1645. Robert Hawes was born 12 May 1611 in Ashford, Kent, England. John Fairfield was born in 1612 in England. He married Elizabeth Knight 7 Jun 1632 in England. John died 22 Dec 1646 ‎(Age 34)‎ Wenham, Essex Mass. Elizabeth Knight Fairfield married again after John Fairfield’s death. Her second husband was Peter Palfrey. There was some litigation between the children of John and Elizabeth and Peter Palfey over John’s estate after the death of their mother Elizabeth. ROBERT EDWARDS, Concord, came from London in the Hopewell, Capt. Babb, in the autumn of 1635, aged 22, or he may be the same wh. seven days earlier than his entry for Babb’s sh. is, at the London custom ho. certif. to have tak. the oath of allegiance being aged 27, and to pass. to Virg. Possib. only one man so nam. was in London. He by w. Christian, had at C. Sarah, b. 12 Sept. 1640, d. in 2 wks. ; Christian, 15 Mar. 1646, and sev. others, prob. bef. as well as after. He was freem. 18 May 1642, d. early, for his inv. was tak. 18 Dec. 1646. ROBERT, Salem, br. of Matthew, s. of that wid. wh. m. Robert Hawes, and d. 1645, as in her will of 12 June in that yr. is seen. Robert Hawes’ Wife, 1th mo., 1645. 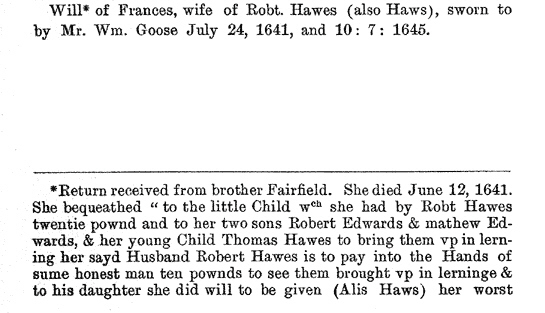 Will of Robert Hawes’ wife, testified to by witnesses William Gooses, Katherine Darlin, Sarah Bartlett, who heard her on her death bed, on the 12th June, 1645, dictate her will, mentions the young child Thomas she had by Robt. 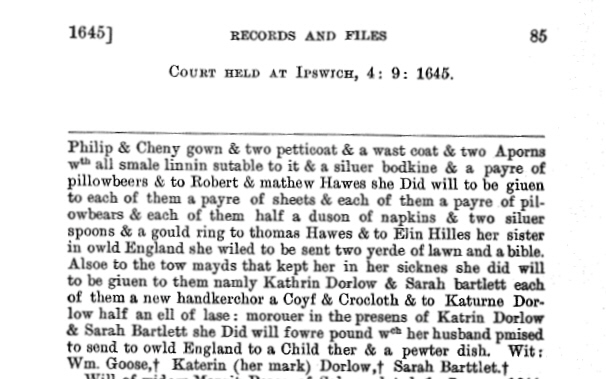 Hawes, £20, her three sons, Robert Edwards and Matthew Edwards .Robert Hawes daughter, Alise, his sons, Robert and Matthew, her sister, Ellen Hibbert, in Old England, two maids who tended in her sickness, viz: Kathrin Darlin aud Sarah Bartlett.—’ Probate 10th 7th mo., 1645. In 1641 “brother <John> Fairfield” presented to the Court the nuncupative will of his Francis, then wife of Robert Hawes. In the proceedings there is mention of her children Robert and Matthew Edwards, Thomas Hawes, and a “sister Ellin Hilles in Old England”. He prepared his will December 11, 1646 and made bequeaths to wife Elizabeth; to sons Walter, ae. 8 years, and Benjamin, ae. 2 years; cousin Matthew Edward’s land within my farm had from Salem; Henry Bartholomew and Robert Hawes of Salem, supervisors of will. His estate was inventoried December 23, 1646 and probated July 6, 1647. Peter Palfrey, Elizabeth’s second husband, gave bonds to pay the portions of the three children, Walter, John and Benjamin. In 1658 Peter Pelfrey stated in a lease that Benjamin Fairfield would be twenty years old on July 21, 1666. In February 1659 Matthew Edwards conveys a deed of property inherited from “Uncle John Fairfield deceased”. John Fairfield had land in Charlestown in 1638 by which others (including George Bunker) bounded their property in the Charlestown Book of possessions (Boston Record Commissioners* Report, Volume III, pp. 3-4, -26, 28, and 40), although his own land was not recorded, probably because before the registration was completed in 1639 he had moved to Salem and sold the Charlestown property to some one else who registered it in his own name. Had liberty from the town to buy John Baker’s house, 1638, Tradition in some branches of the family says that he came over-to Massa­chusetts in 1635; this is so far undocumented. Salem Court Record of July 16, 1639, says: “John FFairefeild desires accommodation” and on Dec. . 23t 1639, he was granted land, 80 acres for a farm, “10 acres of which to be meadow”. He later bought 18 acres from William Fisk, and had “house (and) ground” in co-partnership with [our ancestor] Joseph BATCHELDER. Admitted to Salem Church, August 25, 1639; freeman, May 13, 1640.- the Enon area in which his land was situated was set apart as the town of Wenham on “ye tenth day of ‘ ye third month anno 1643” (May 10, 1643 old style); On a later survey, part of his eighty acres proved to be in the part of Ipswich known as Ipswich Hamlet, now called Hamilton. 1638: John Fairfield granted liberty to buy John Baker’s house in Salem. March 27, 1643 (March 1670 court record): John Fairefield’s house boundary in Ipswich, MA, referenced. December 26, 1643: John Fayrfield fined 30s for “attempting the chastity of wife of Goodman Goldsmith.” According to Lisa Lauria of the University of Virginia in section VII. of her interesting article on Sexual Misconduct in the Plymouth Colony, this wording indicated an attempted act or proposition of adultery. September 9, 1646: “John Fairefilde” presents inventory of widow Mary Hersome of Wenham. Only known autograph of John appears on this original document, according to Wynn Cowan Fairfield. December 11, 1646: John Fairfield writes will in Wenham, MA. He dies between then and December 23, 1646, when inventory of his estate was taken. The will was proven in court July 6, 1647, by Robert Hawes & William Fiske and sworn to in court July 7, 1647 by widow Elizabeth Fairfield. Click here for text version and image of will. Wit: Jo. Fiske, William Fiske, Robert Hawes. 25 Jan 1641 Robert Hawes brought civil action against William Pester for an incurred debt (Source: Court Records: Massachusetts Colony: Salem.). 12 Jul 1642 – Samuel Eaborne brought civil action against Robert Hawes; Robert Hawes brought civil action against Charles Glover for an incurred debt, and Robert Hawes brought civil action against Robert Lewes for an incurred debt (Source: Court Records: Massachusetts Colony: Salem.). On July 10, 1644 Thomas Smith brought civil action against Robert Hawes (Source: Court Records: Massachusetts Colony: Salem.). On September 9, 1645, by Adjournment, the will of Frances, wife of Robert Hawes, sworn to by Mr. Wm. Goose July 24, 1641. On September 10, 1645, Return received from brother Fairfield. She died June 12, 1641. She bequeathed to the little Child wch she had by Robt Hawes twentie pownd and to her two sons Robert Edwards & mathew Edwards, & her young Child Thomas Hawes to being them up in lerning her sayd Husband Robert Hawes is to pay into the Hands of sume honest man ten pownds to see them brought up in lerninge & to his daughter she did will to be given (Alis Haws) her worst Philip & Cheny gown & two petticoat & a wast coat & two Aporns wth all smale linnin sutable to it & a silver bodkine & a payre of pillowbeers & to Robert & mathew Hawes she Did will to be given to each of them a payre of sheets & each of them a payre of pillowbeers & each of them half a duson of napkins & town silver spoons & a gould ring to thomas Hawes & to Elin Hilles her sister in owld England she wiled to be sent two yerde of lawn and a bible. 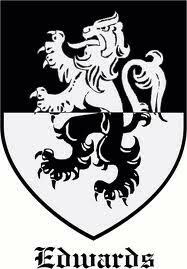 Alsoe to the two mayds that kept her in her sichnes she did will to be given to them namly Kathrin Dorlow & Sarah bartlett each of them a new handkerchor a Coyf & Crocloth & to Katurne Dorlow half an ell of lase; morover in the presens of Katrin Dorlow & Sarah Barltett she Did will fowre pound wch her husband pmised to send to owld England to a Child ther & a pewter dish. Wit: Wm. Goose, Katerin (her mark) Dorlow, Sarah Barttlet (Source: Court Records: Massachusetts Colony: Salem.). On February 23, 1648 Robert Hawes was fined for want of scales and weights in his mill (Source: Court Records: Massachusetts Colony: Salem.). On November 24, 1657 Robert Knight brought civil action against Robert Hawes for an incurred debt (Source: Court Records: Massachusetts Colony: Salem.). On March 30, 1658 Mathew Edwards, aged twenty-five years, deposed that he had often seen the colt of John Hakes, sometimes four days in the week, and in his conscience this was the colt (Source: Court Records: Massachusetts Colony: Ipswich.). This entry was posted in 12th Generation, Immigrant - England, Line - Miner and tagged Salem, The Hopewell 1635. Bookmark the permalink.